An Angus councillor is raising concerns about plans to get rid of some of the area's payphones. BT is considering removing about 42 of the region's loss-making phone boxes and a consultation concerning 31 of them is now under way. SNP councillor, Donald Morrison, is worried about the safety of people in rural areas where mobile phone reception is poor. BT has said it will not scrap any payphone if there is a social need. The telecoms company does not have to consult the local community if it is removing a phone box in an area which has another within 400m. However, the firm does need to ask for the public's view in other cases. Mr Morrison, a councillor for Arbroath East and Lunan, said: "Many of them [the phone boxes] are in rural areas in Angus. "We are seeing the possible closure of post offices, last week we had the possible closure of a rural school, so it's another chipping away of rural communities. "I'm a bit concerned about the ones they're proposing for Glenisla where you don't get a signal. "We know how quickly the cold can come into Scotland, so getting rid of payphones just because they're not used as much as they should be is not a reason if that phone can save a life." 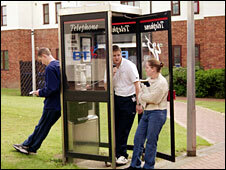 A spokeswoman for BT said in Angus there were 165 payphones and 129 of them were unprofitable. She added: "Scotland-wide, we plan to remove 488 payphones that have another situated nearby. These include 11 kiosks in Angus - three in Montrose, three in Arbroath, two in Brechin, and single kiosks in Forfar, Monifieth and Carnoustie. "In all instances where there is not another payphone within 400 metres we need the local authority's consent to remove the kiosk and if there is a clear social need for those phones then they won't be removed. "UK-wide, less than one call a week is made from more than half the kiosks in the consultation and less than one call a month made from a third."